Founded in 1939, Toulemonde Bochart is a family textile company that creates high-end design rugs, bringing elegance and modernity in our interiors. Founded in 1939, Toulemonde Bochart is a family textile company that creates high-end design rugs, bringing elegance and modernity in our interiors. Beginning in 1980, this French company says the creation of complete lines of recognized designers: Christophe Pillet, Andrée and Olivia Putman, Hilton McConnico, Jean-Charles de Castelbajac, Olivier Lapidus, Eric Gizard. Toulemonde Bochart signature on a carpet is a quality label. Natural fibers used for coating materials: 100% wool or cotton, silk plant ... Their expertise includes hand tufted, hand-knotted and hand-woven. This hand knotted rug plays all fronts. Simple colorful graphics are revealed by treatment of the hand spun fiber which is looped and cut. 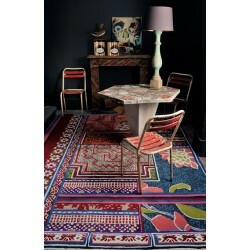 It is both modern and ethnic finding the inspiration in nomadic history. A subtle play of nuances in warm or cool tones serves to enliven surfaces by lending a new dimension. With its low sensitivity to humid marks, this yarn affords a sheen similar to art silk, without its fragility.